Baltimore has the secret sauce for producing electrifying poetry — woke, young people; and a space for them to be heard. Last summer, Charm City cleaned house at Brave New Voices, an international poetry slam compe­tition, placing first in the adult and youth team poetry slams, in addition to taking home the individual grand slam championship title. While Baltimore has consistently competed at the national slam level for more than two decades, the city only recently gained the reputation as a mecca for poets. What changed? The voices of this city’s talented youth went from amplified to louder than a bomb. A shout-out to the 1988 Public Enemy song by the same name, Louder Than A Bomb (LTAB) is a national youth poetry program that was founded in Chicago in 2001 and has since expanded into several American cities, promoting collaboration between poets and educators. Baltimore is one of those cities. 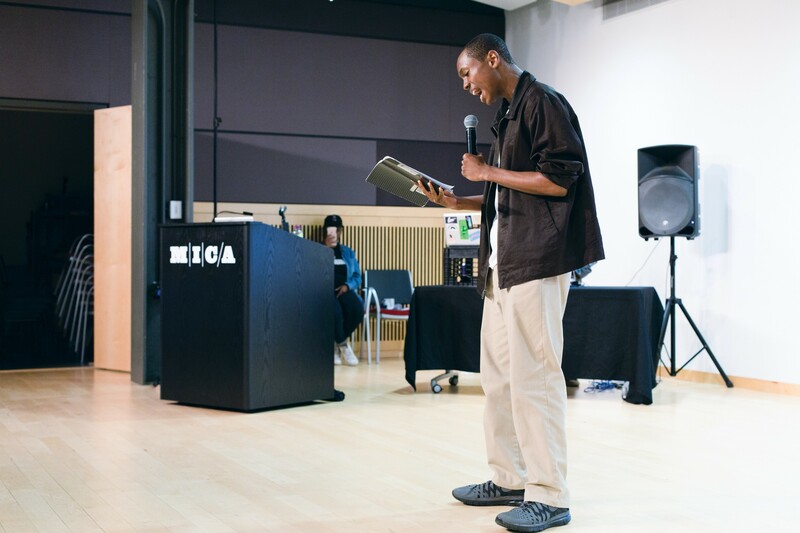 For the past three years MICA has partnered with Dew More Baltimore to bring LTAB programming to middle and high schools across Baltimore City and County. Dew More is a community-based organization that was founded in 2012 with the mission of using poetry and art to promote civic engagement. The nonprofit manages LTAB-Baltimore programming and supplies teaching artists to work with the school poetry teams and collaborate with a coach on staff at each school. “Poetry becomes a vehicle for these students to process trauma or life-changing experiences,” Shyla Rao ’96 ’98 (Sculpture B.F.A and M.A.T. ), former director of MICA’s Master of Art in Teaching program explained. Rao was the face of MICA’s part­nership with Dew More. She co-taught a Developing Critical Literacies class with Kenneth Morrison, founder of Dew More. In the class, MICA students are equipped with Morrison’s own teaching philosophy and can learn from his years as an accomplished poet. (He happens to be the holder of that 2016 Brave New Voices individual grand slam championship title.) A variation of the national LTAB curriculum, Mor­rison’s approach consists of shoring up the youth’s emotional, cognitive and social development, using poetry as a tool to guide youth through these critical phases of learning. The Baltimore youth’s mastery of literary devices is apparent in their ability to take weighty sub­jects — racism, systematic oppression, depression, bullying, death, government corruption — and process them through poetic stratagems to create transfixing messages that move audiences to tears, laughter and, most importantly, action. Two years ago, in April 2015, students partici­pating in LTAB-Baltimore walked to a local police station and performed an impromptu set of their newly-authored poems. Days before, Derick Ebert, who was also a participant in LTAB-Baltimore, became the city’s first youth poet laureate and promptly announced his intent to use his position toexamine social issues and youth struggles with identity. At a time when the city was consumed with vigils and protests in the wake of Freddie Gray’s death, Baltimore youth were using their lyrical tools to contribute to a national dialogue. 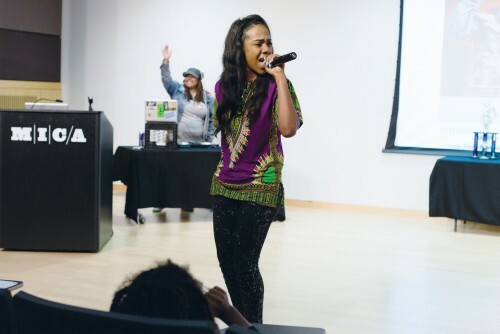 Each April, during National Poetry Month, MICA hosts an LTAB-Baltimore poetry slam compe­tition between the middle- and high-school stu­dents, in addition to a college slam. 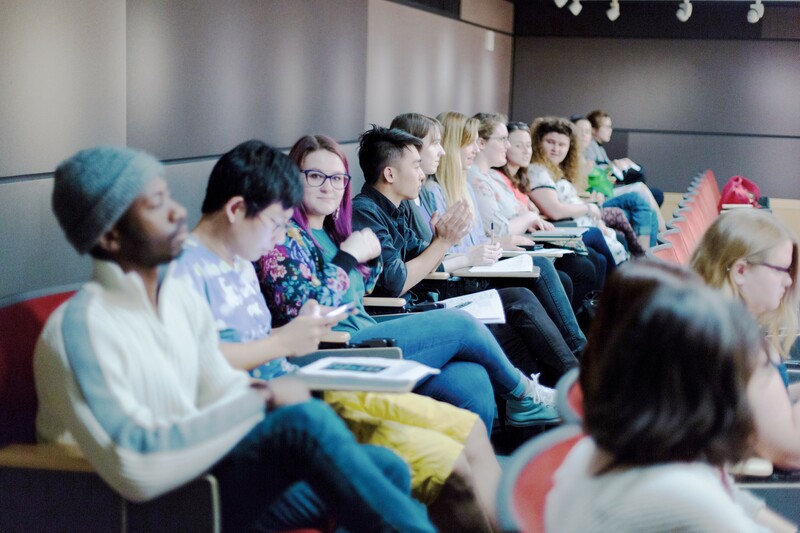 The night before the competition, MICA students from Rao’s Developing Critical Literacies class teach com­munity-building workshops for the middle-and high-school poetry teams. Winners of the high-school slam earn bragging rights and seats on the Baltimore Citywide Youth Poetry Team, which competes at the Brave New Voices international competition. On April 22, for the fourth year in a row, Woodlawn High School took first place at the LTAB-Baltimore festival. Also for the second year in a row, MICA’s sophomore graphic design students were engaged in conjunction with LTAB-Baltimore to create the Baltimore Art Rising exhibition, book and posters of student poems, using only the words as typographic expressions. As with last year, the book of poems and illustrations will be published and shared with the young people, teaching artists, principals and community members. Supported by the Samson Feldman Fund, the project adds one more layer to the web of LTAB-Baltimore and MICA partnerships.